China was named in Norway’s security assessment report as a threat to the Scandinavian country’s national interests. The report, published by Norway’s police security service (PST) on Feb. 4, identified threats by Chinese and Russian intelligence operations, some targeting Norwegian businesses, as posing a great challenge to the country. “If they succeed with the operations, they can cause great harm to Norway and Norwegian interests,” the report stated. Though the report did not name China or Russia in connection to a specific operation, it instead warned of different kinds of operations that have taken place in the past and will continue. One such operation involves foreign intelligence officers, some who operate under the cover of being employed by an embassy or business institution, recruiting individuals in order to obtain sensitive information, according to the report. The recruitment may take place through social media or at open seminars and conferences. The report warned Norwegian citizens against staying in authoritarian countries, where local intelligence officers could pressure Norwegians to carry out assignments. At the same time, foreign nationals with legal residence and work in Norway may be approached by intelligence officers from their native countries. “State-controlled network operations” is another threat against Norway, whereby corporate networks are hacked into through tactics such as sending emails embedded with malware. The report warned that many key Norwegian sectors—including defense and space technology, maritime technology, renewable energy, and critical infrastructure—will be particularly vulnerable to network penetrations in the coming year. The report also warned that several states have attempted to use investments and acquisitions as an instrument to influence political decisions, obtain sensitive information, and gain access to technology in Norway. The report warned that such attempts will likely occur in 2019. In other instances, Norwegian suppliers are indirectly acquired through illegal tactics, such as foreign entities disguising themselves through a large number of intermediaries in several countries, and creating very complex corporate structures, the report claimed. Finally, the report warned about the long-lasting impact as a result of these foreign activities, such as foreign states trying to influence public opinion and political debate in Norway. The country’s political assessment, such as its stances on sanctions and public criticism of other states, could also be influenced by the foreign investment. 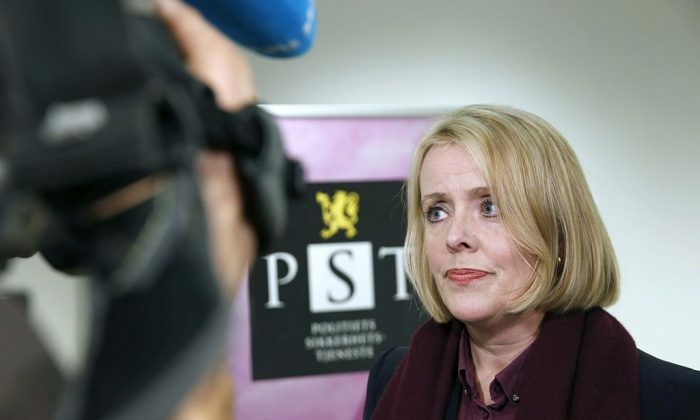 While presenting the report at a press conference on Feb. 4, Marie Benedicte Bjørnland, head of the PST, specifically named one Chinese company as posing a threat to Norway, according to AFP. “One has to be attentive about Huawei … and about the close connections between a commercial actor like Huawei and the Chinese regime,” Bjørnland stated. The company’s founder and CEO Ren Zhengfei, was a former engineer within China’s military and currently a member of the Chinese Communist Party. China’s National Security Law, which took effect in June 2017, requires China-based companies, operating domestically or abroad, to surrender information to Beijing on request. Many countries around the world, including the United States and Australia, have raised similar security concerns about Chinese tech giant Huawei, with some banning the Chinese company from supplying equipment for their 5G networks. According to Reuters, two of Norway’s biggest telecoms companies, Telenor and Telia, currently use Huawei equipment for their 4G networks, and are testing the Chinese tech giant’s equipment for their experimental 5G networks. Both companies have said they are in talks with the Norwegian government about Huawei’s security issues and have yet to choose a supplier for their 5G networks. Meanwhile, Norway’s justice minister Tor Mikkel Wara stated at the press conference that the government is currently working on a regulatory framework to protect the country’s critical infrastructure. In January, Wara, speaking to Reuters on the sidelines of a business conference, said the government was considering taking steps similar to those taken in the United States and Britain in banning Huawei from Norway’s 5G network. Though Chinese investment was not spelled out in the report as a security concern, the Chinese regime has pursued aggressive investment into Norway. China has expressed interest in creating a new shipping route that goes through the Arctic, taking advantage of the melting Arctic ice sheet. The route, called the “Northern Sea Route” by Beijing, would save money and time compared to the traditional route through the Suez Canal. Developing the route is a project under China’s “One Belt, One Road” (OBOR, also known as Belt and Road) initiative. Chinese leader Xi Jinping, while meeting with Norway’s Prime Minister Erna Solberg in Beijing in April 2017, stated China’s desire to work with Norway, according to the official website of China’s embassy in Norway. Currently, the intergovernmental forum Arctic Council consists of eight Arctic states, including the United States, Denmark, Russia, Finland, and Norway, while China is an observer. The observer status allows China to participate in meetings of the Arctic Council and propose projects. Chinese investments have also focused on key sectors like transportation and minerals. In December 2018, Global Times reported that China’s state-owned Sichuan Road and Bridge Group (SRBG) completed construction of the Halogaland Bridge, a 1.5-kilometer-long (about 0.93 miles) suspension bridge near Norway’s northern port city of Narvik. SRBG was awarded a $96-million contract to build the bridge in 2013. In October 2017, China’s state-run media People’s Daily reported that the Chinese regime wishes to invest in Kirkenes, a port city facing the Barents Sea, which is south of the Arctic Ocean. Finnish media reported that authorities in Kirkenes were interested in turning the city into a key transit hub for China’s Arctic shipping route, including with a proposed rail linking the city to Rovaniemi in Finland. And in 2016, Elkem, a Norwegian firm acquired by China National Bluestar—itself a subsidiary of China’s state-owned chemical company ChemChina—announced that it would buy the Norwegian silicon-based material producer, Fesil Rana Metall AS, according to the official website of ChemChina.